Recipe from Kelli Freeman, Director of 7UP Brand Marketing, Cadbury Schweppes Americas Beverages. 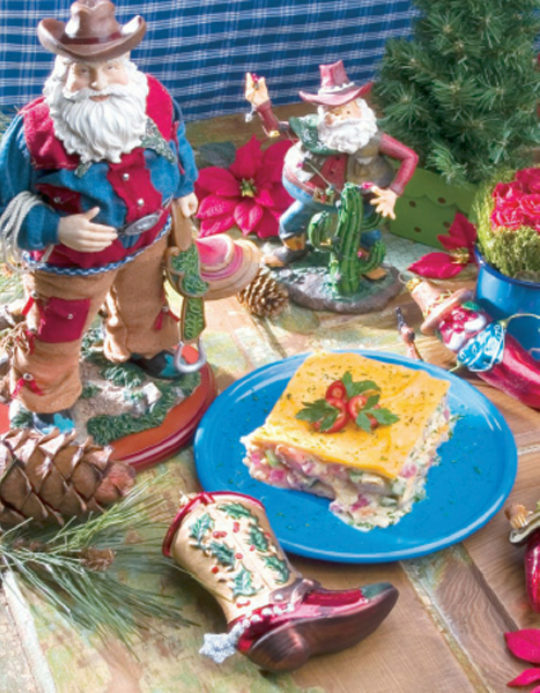 This Green Chili Casserole is anything but ho-hum! Serve this up and your family will say, "Yum! Yum! Yum!" Peppers, onions, and garlic give this casserole a real bite. On a baking sheet place peppers in oven and roast for 45 minutes. Cool. Peel peppers and remove stems and seeds. Dice peppers and set aside. In a large saucepan, sauté diced chicken with canola oil until almost cooked through. Add onions and garlic and sauté until onions are translucent. Add roasted peppers and oregano and sauté briefly. Add flour and cook for 3 minutes. Add first amount of chicken stock and lime juice and bring to a boil. Reduce heat to a simmer and cook for 10 minutes. In a small bowl, combine cornstarch and second amount of chicken stock and mix. Add cornstarch mixture to chicken mixture and cook for 2 minutes. Remove from heat and stir in half and half and salt. In a 9"x13" casserole dish, lay 6 tortillas on the bottom. Pour 1/2 of the chicken mixture over tortillas and cover with 1/2 of the cheese. Repeat, ending with cheese. Bake for 45 minutes.